SAFETY HARBOR, FLORIDA: “I’ve been an audio engineer and musician for close to forty years now, and I’ve spent most of that time passionately pursuing audiophile-quality capture and reproduction of live musical events,” said John Servies, one of the team of audio engineers behind NPR’s From the Top, which brings the stories of young musicians to 700,000 loyal listeners every week. “I enjoy systems that can impart the full intent of the artist, and I’m interested in the science of how that happens. I want to achieve a translatable effect from what the artist produces to what the audience hears; but there’s so much that can get in the way of that.” When he’s not taping for From the Top, Servies works FOH for Itzhak Perlman’s In the Fiddler’s House, Hankus Netsky & The Klezmer Conservatory Band, and a long list of one-off engagements. In short, Servies is blessed with the opportunity to travel the world, working with brilliant artists to help them fully realize the emotional impact of their craft through faithful sound reinforcement and capture. What stands in the way of faithful sound reinforcement and capture? “The list is almost infinite,” said Servies. “But some of the biggest issues involve the acoustic environment, which includes the ways reflections, diffusion, and room modes and resonances interact. Nonlinearities in microphones, consoles, amplifiers, and especially loudspeakers can really upset the purity of sound reinforcement. And then you have to combine those two universes of potential distortion with loudspeaker placement. 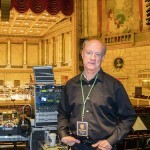 I routinely walk into new venues, and I only have a short amount of time to assess the acoustics and electronics and make corrections before the show or taping begins.” To speed that process and to improve its accuracy and repeatability, Servies has been using Metric Halo’s SpectraFoo sound analysis software since 2002. SAFETY HARBOR, FLORIDA: “I kind of accidentally fell into producing,” claims Josh Wilbur. “I started playing in bands in high school and then naturally gravitated to the other side of the glass. I thought I was just an engineer until someone pointed out that I was really engineering and producing the bands I was working with.” That’s fine with Wilbur, whose passion is great music and the creative process that brings it to life. 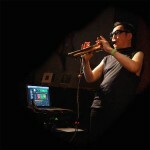 In his view, recording technology is merely a tool to elicit and record great music. He started out in rock music, then moved to working with pop and R&B acts like NSYNC and Lil’ Kim, and then Wilbur gravitated, over the years, back to his roots with rock music. On the way, he picked up a Grammy for engineering Steve Earle’s Washington Square Serenade and has subsequently earned three Grammy nominations with metal powerhouse Lamb of God. One of the hits from their latest work, “VII: Strum and Drung,” is up for a Grammy in the Best Metal Performance category. 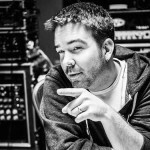 Wilbur produced, recorded, and mixed the project, and, as with all of his recent work, he used Metric Halo’s ChannelStrip plug-in on all the drums, guitars, and bass. SÃO PAULO, BRAZIL: What aspect of sound for pictures doesn’t Marcelo Cyro have a role in? A native of São Paulo, Brazil, Cyro graduated from the SAE Institute, Netherlands with an emphasis on mixing and mastering for surround. He studied in Koln and Paris and worked for a decade doing post-production audio for advertising, with clients such as Visa, MasterCard, Pepsi, GM, and Volkswagen. In São Paulo Cyro became a partner in the high-profile, audio post-production facility WeCanDo Audio Post, where he oversees editing, ADR, sound design, Foley creation & editing, mixing, and mastering. WeCanDo’s credits include the Brazilian movies Chatô, Apnéia, Farewell, and Jonas; cartoon series such as Gemini 8 (Brazil’s first Disney production), Luna's Show (Discovery Kids) and other projects, such as Sitio do Pica-Pau Amarelo (Brazil’s first 5.1 cartoon); A Boy and the World, Open Road, and Cidade-cinza. As if that weren’t enough, Cyro also devotes his talents and time to teaching the next generation of audio professionals through MusicBit (www.musicbit.com.br). 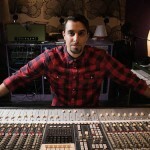 Born and raised in Rome, Italy, Marciano worked for over eight years all around the world as mix engineer and producer. He moved to New York City in 2013, where he continues to work for clients throughout the world. 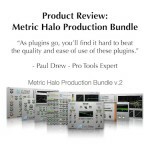 “Since I discovered Metric Halo’s ChannelStrip plug-in in 2012, when it was mentioned in an online article, it’s been my secret weapon,” he said. 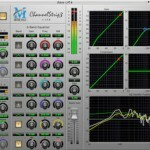 “I’ve used ChannelStrip on literally every vocal track and percussion track I’ve mixed in the past three years. Every single one! It’s remarkably versatile. I can use the EQ section alone and get utterly transparent results or I can engage the compressor and get a beautiful color. Either way, the sound quality is solid. Metric Halo’s plug-ins sound more analog than digital. It has a depth and clarity that blows my mind.” Marciano works his magic in the genres of pop, rock, metal, hip-hop, R&B, funk, electronic, and orchestral. Marcelo Cyro - from the Oscar nominated animation, The Boy And The World - demonstrates how to create distance in Pro Tools for dialogue in audio post production using MH ChannelStrip, in this Pro Tools Expert tutorial video. 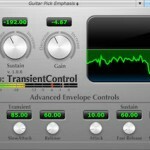 Special Thanks to Pro Tools Expert, Mike Thornton, for posting this tutorial video! LIO-8 RANKED! Metric Halo LIO-8 Named one of Attack Magazine's "Ten of the Best: Audio Interfaces." "Florida’s Metric Halo make a fairly small range of high-end interfaces. We’ll shine the light on the LIO-8 here for two reasons: it’s a lot more affordable than the flagship ULN-8, and it’s a bit different to the other selections on our list. The basic LIO-8 unit is simply an eight-channel line-level interface with no preamps. The unit can also be upgraded with mic pres, but at its heart it’s a device which prioritises clear, transparent conversion above all else, allowing you to use it in whatever way suits your creative process. That flexibility will undoubtedly appeal to a lot of electronic music producers. Whether you’d prefer to hook up your own outboard mic pres, use an analogue mixer, or even if you only record line level sources, the LIO-8 is an interesting option. After all, why pay for mic preamps if you don’t intend to use them?" The TEC Award-Winning Metric Halo LIO-8 is available though your local Metric Halo dealer or distributor, as well as directly from Metric Halo via their Online Store. MH TransientControl: Modify dynamics in ways that aren't possible with traditional compressors, with Metric Halo's easiest-to-use and highly desirable AAX|Native, AAX|DSP, AU & VST plugin (Mac/Win). On Sale for $75 (MSRP $179). Or, purchase as part of the MH Production Bundle - BEST VALUE - All 8 Plugins On Sale for $299 (MSRP $699). These prices won't last. Try or Buy today! 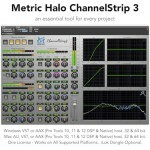 Get started QUICKLY with the legendary Metric Halo ChannelStrip 3 for AAX|Native, AAX|DSP, AU & VST (Win/Mac): 100+ presets included!